Get notified of our AUCTIONS & NEW INVENTORY instantly! One sheet ORIGINAL MOVIE POSTER issued by the studio when the film was released and meant for theatrical display. This poster has been Linen Backed and is ready for framing. This is a vintage original poster from our archives. These can be very difficult to find in any condition! A long time can go by without one of these coming up for sale. You will have trouble finding a nicer one. Very typical minor fold line touch up. We evaluate and grade our linen backed posters prior to linen backing / restoration. We do this because after a poster has been restored it can sometimes be very difficult to determine exactly what was done to it. Vintage rolled posters do exist, however they are extremely rare. We can have any folded poster. Which will make the fold lines virtually disappear. Also please note that most movie posters were actually used at the theater, and some will contain slight imperfections such as: writing on the back, pin holes, fold wear, small tears, etc. These are all very common and to be expected, but if they bother you, all these minor flaws can be remedied in the linen backing process. Linen Backing preserves and can actually increase the value of a poster. We will put in writing that we guarantee it to be an Original Movie Poster. 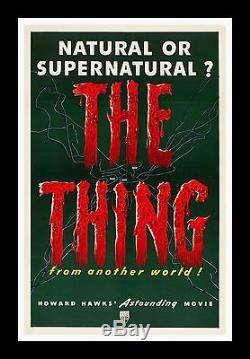 The item "THE THING CineMasterpieces 1951 SCI FI ORIGINAL HORROR MONSTER MOVIE POSTER" is in sale since Sunday, April 7, 2013.